Infotainment in vehicles that hit luxury territory are the ones you have to be the most careful with, and that’s because they don’t always get the best features and integration first. Few other vehicles I’ve test driven have confounded passers-by more than this one. The Genesis G70 is a slick-looking vehicle but it always surprised people that it was, in fact, a Hyundai model. The luxury of this mid-sized sedan belies a surprising dichotomy in the cabin, which is that everything looks fabulous, yet it’s still missing some important pieces. 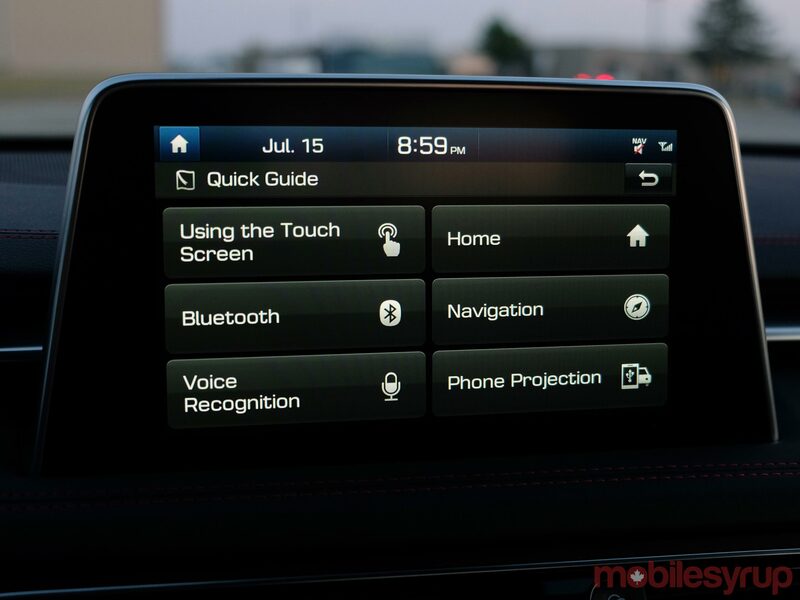 To be clear, this isn’t the BlueLink infotainment system that pervades the automaker’s other models. The Genesis system is supposed to stand on its own. There is some overlap between the two brands, but some of the integrative innovation appears to be trickling up, not down. Being my first foray into infotainment a la Hyundai, I wasn’t entirely sure what to expect, though I did believe that what was available would be comparable to other vehicles in a similar price range. 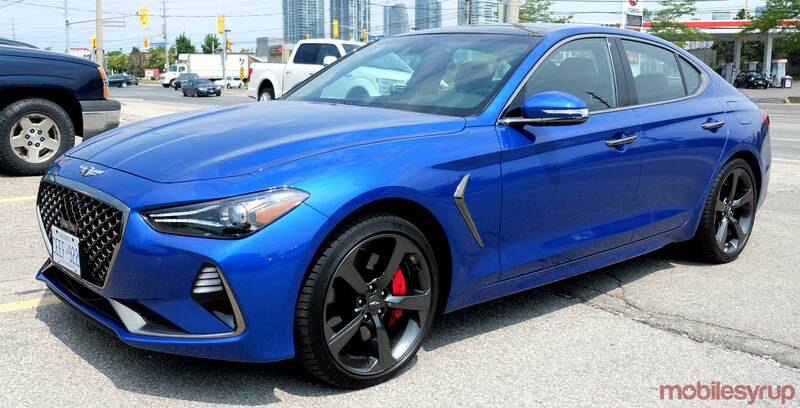 The Genesis G70 starts at $42,000, so it’s not the cheapest ride out there. Overseeing all of the onboard tech is the 8-inch touch display, with a 15-speaker Lexicon sound system making sure everything is audible. So as to offer drivers the best of both worlds, a number of physical buttons, including a volume knob, are laid out to offer full control. There is no other fancy input method like those seen in other vehicles. No touchpad, rotary dial, gesture control or something along those lines. That approach does pay some dividends, which I’ll get to later, but in all trims, the Genesis doesn’t throw anything unique in from that perspective. 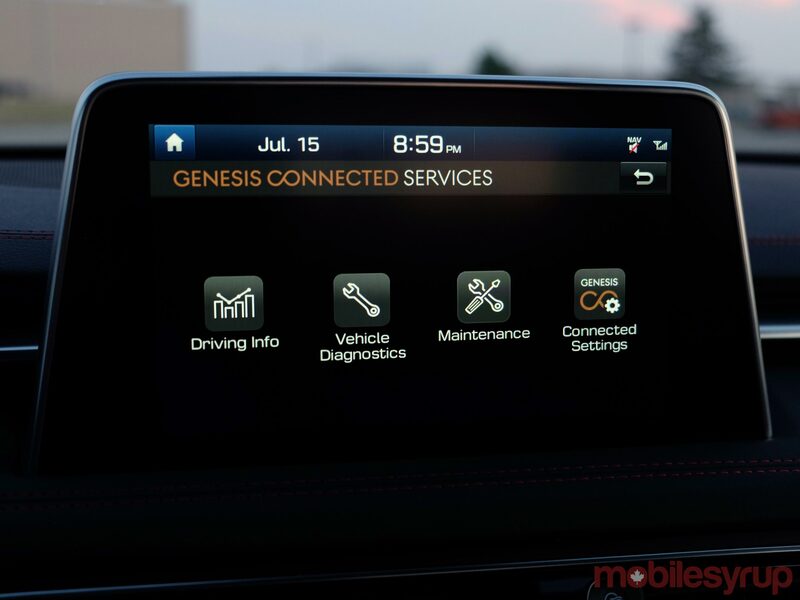 Hyundai prioritizes safety features more than actual smartphone integration when marketing the Genesis. It makes sense, given the income bracket these cars are looking to hit, but paying a little extra should ideally also deliver something cutting edge on other fronts. Here, the Genesis system borrows from BlueLink. 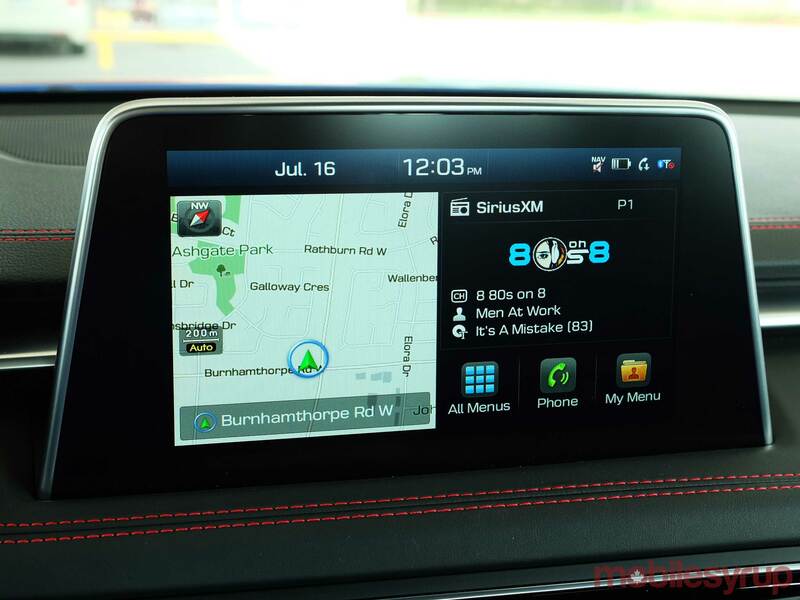 Both Apple CarPlay and Android Auto are standard on the system, regardless of trim. 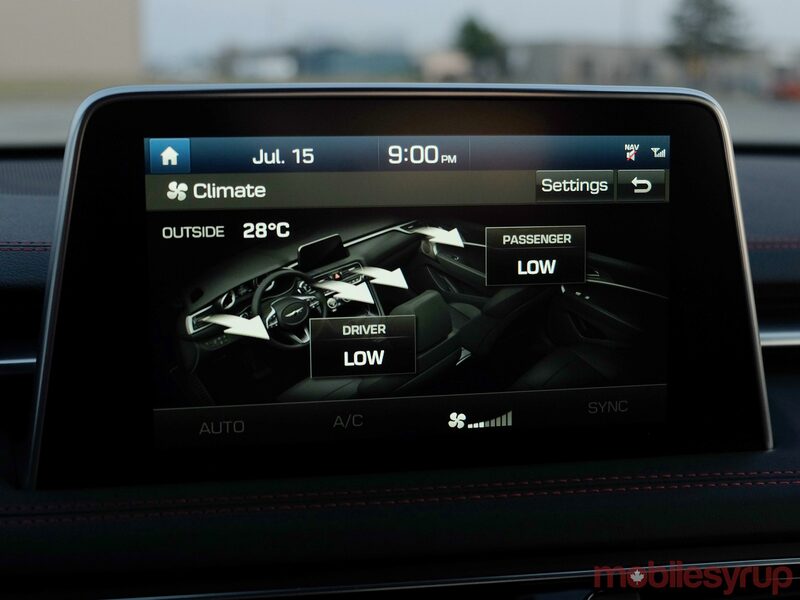 However, there is no in-car LTE or Wi-Fi hotspot to add an extra level of connectivity. But there is a SIM card inside, primarily for the connected services Hyundai offers under the Genesis brand. Bluetooth is standard, as always, and up to a handful of phones can be stored in its memory. Two phones can also be paired at once, but I’m not clear that it will allow one to stream, while the other can take incoming phone calls, for example. Siri Eyes Free and Google Assistant both work via Bluetooth, with a long press of the steering wheel’s voice button triggering either assistant. A quick press still brings up Hyundai’s own voice recognition, which even at the best of times, is limited. The primary USB port for phones is in the bottom of the dash, next to the 12-volt socket and Aux-In jack. Next to that is a Qi wireless charging pad nestled inside, with a rubberized cover that comes off to make it easier to clean. Here, too, there is not a wide array of connections. Two USB ports adorn the bottom of the dash, both of which can be used to connect to the SLDA. A 12-volt socket and Aux-In port round out an otherwise unsurprising — though important — set of options. Despite having wireless charging inside, there’s no way of using it to wirelessly connect to either CarPlay or Android Auto. You have to plug in with a cable. This particular G70 trim came with in-car navigation, somewhat negating the need to use Google Maps or Waze. Well, to a degree, anyway. Real-time traffic is one of the keys to those two platforms, as is the accuracy in delivering turn-by-turn directions. For iOS users, on the other hand, Apple Maps’ enduring slide as a viable option is somewhat offset by having satellite-based navigation in the car. Adding these two platforms immediately changes the whole dynamic of using an iPhone or Android device in the car. That’s not just the narrative for Hyundai, it’s the reality throughout the auto industry. Here, both acclimate well to the general setup. While the 8-inch display is touch-enabled, Hyundai has included basic buttons to control music playback. It’s also very easy to switch between either platform and the Genesis system as well. I found it easy to go from listening to Spotify on CarPlay and over to a station on SiriusXM and terrestrial radio. Their presence looms larger when it comes to hands-free usage. Bluetooth is fine for phone calls, and even sending a quick text to someone by voice. But when it came to listening to messages, it was simply easier to do it through CarPlay or Android Auto. The same is true with music and podcasts. The Genesis system offers no app integration, so the only way to get deeper into menus and option is to go with either platform. Again, while the basic navigation principles apply well enough, there’s no room for browsing or selecting different things. It’s a shame because the Genesis has a nice-looking layout. The ability to see some of the safety features, vehicle diagnostics, and even a quick guide to learn how to use it. Having both ‘Connected Services’ and ‘Data Services’ icons suggests there would be in-car Wi-Fi, but instead, it’s simply about connecting to the car when away from it. The Connected Services iOS app works with the features offered in the vehicle. That allows drivers to remotely start, lock, unlock, turn on lights and honk the horn. Moreover, they can track the car’s location at all times, which is a nice anti-theft feature. Vehicle health and diagnostics are readily available with monthly reports. There’s also a direct line to roadside assistance. Getting all this requires a subscription after the first three years. Then there’s Alexa and Google Home. The Genesis G80 and G90 have worked with Alexa thus far, but it wasn’t available on the G70 I tested. Pushing information to the car via Google Assistant is also coming, but doesn’t appear to be an option in Canada yet. My review model didn’t show anything about that. When it works, drivers can tell the car to store a destination address remotely, as well as confirm whether doors are locked or not. There already is a measure of luxury in the Genesis line, just by the way the cars drive. 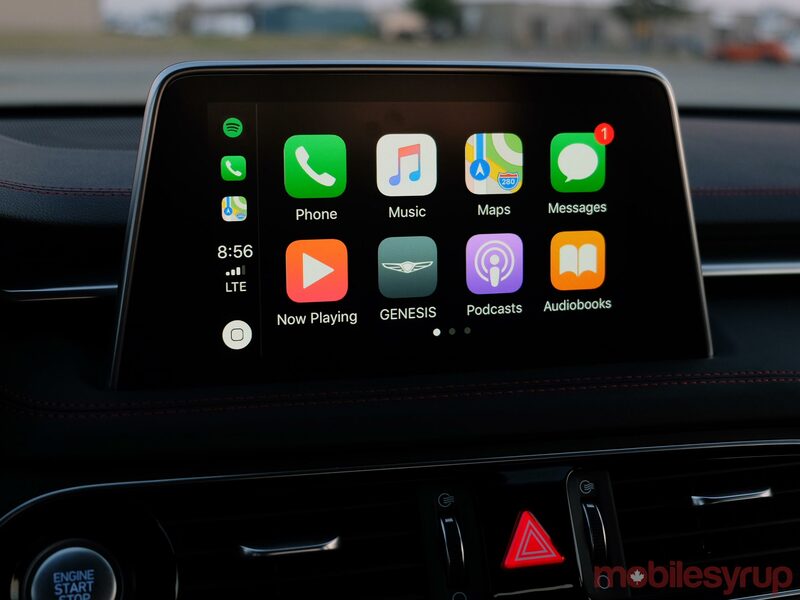 Having CarPlay and Android Auto is great for maintaining newer connectivity, but there’s still plenty missing. Alexa and Google Assistant would add even more interesting integration, but as of this review, it wasn’t readily available. That leaves the hope that those features could be added with future software updates. It should theoretically be possible, but as with anything in the automotive world, upgrades usually never arrive in a straight line. 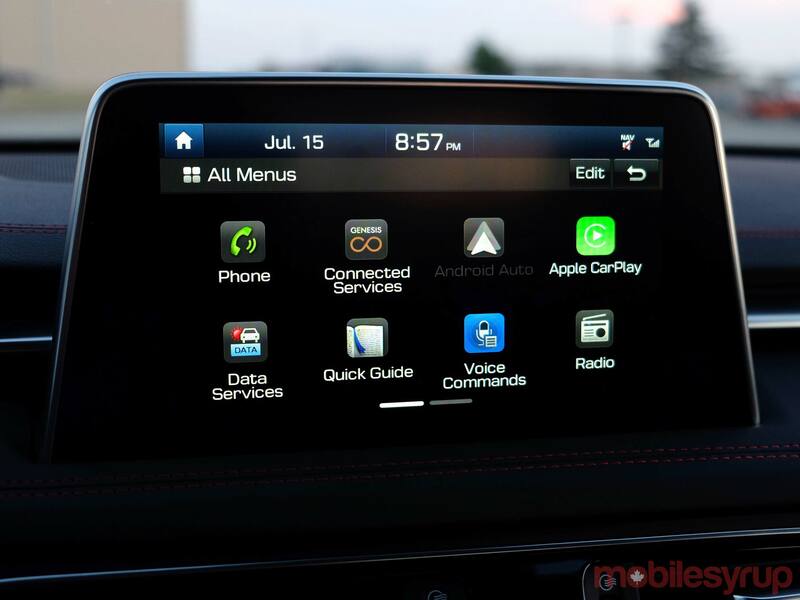 "Having CarPlay and Android Auto is great for maintaining newer connectivity, but there’s still plenty missing"